NDMP is the overall guiding document covering intended activities of the major phases – mitigation, preparedness, emergency operations and post disaster activities, such as relief, recovery and reconstruction. Training, public awareness and education are also covered in the above phases. The users of this plan will be all stakeholders; officials of sub-national administrations (provincial and district); relevant officers and personnel from Governmental and Non-Governmental organizations; community leaders, private sector, civil society, professional organizations and people’s representatives. National Disaster management plan will be implemented in conjunction with other plans on related national policies. Plans and policies of the related sectors covering the subjects as indicated in the Act have been taken into consideration in preparing this plan to the maximum extent possible and where there are any lapses such plans and policies will be taken into consideration as and when identified during implementation. All line Ministries, Departments and agencies, when preparing their plans will take this Plan into consideration. Administrations at Provincial, Local Authority (LA), District, Divisional and Grama Niladhari (GN) levels also will have their plans accordingly. All implementing authorities, NGOs and grass root level organizations will have their operational plans in conformity with National Disaster management plan. 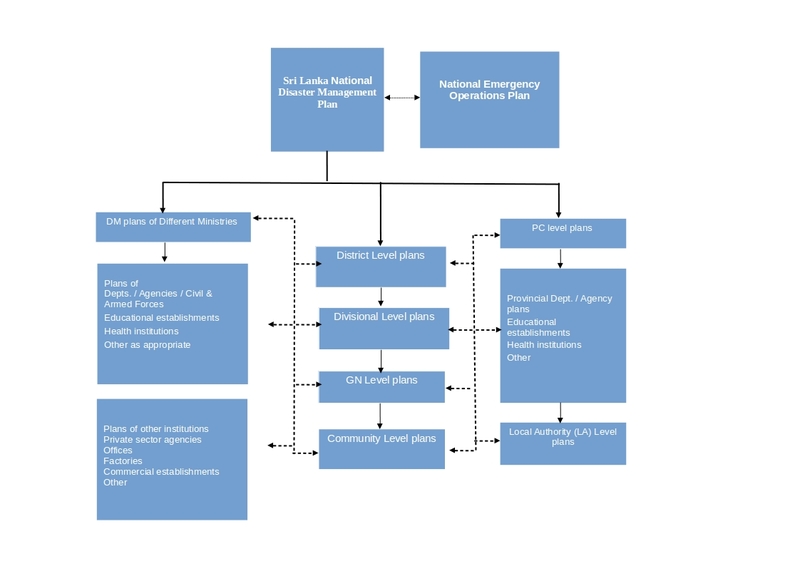 Establishment of mechanisms/systems for Disaster Risk Management (DRM) in Sri Lanka as a multi-sectoral, inter-ministerial, and inter-agency activity, by identifying and assessing the capacities of existing agencies for improving their capacities and mandates as necessary to implement the identified tasks, using methodologies and concepts already developed and field tested. III. Post disaster measures(medium and long term after the disaster), Relief and recovery, Loss and damage assessment, Rehabilitation, Reconstruction, Psychological and trauma counselling, Long-term assistance to rebuild the community is critical for survival. A time frame of five years from 2013 to 2017 has been considered in this plan. Upgrading the Plan will be coordinated by the DMC with the participation of all stakeholders. It will be the responsibility of the DMC to present proposals for upgrading the Plan as and when the situation in the country demands so, i.e., after a review in 5 years; after a major disaster or if any other situation arises demanding a change in the plan.